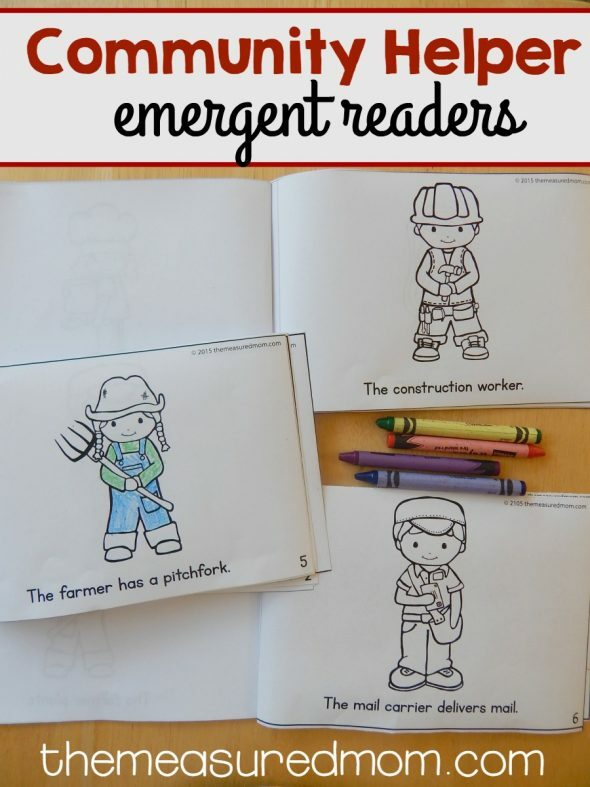 Today I’m sharing a set of three free community helper emergent readers! It’s time for another set of Color Me Readers! 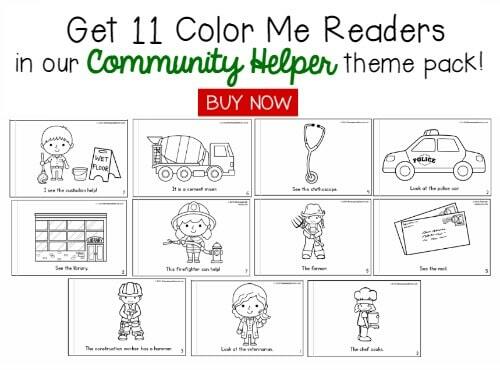 As part of our Community Helpers unit, I created eleven predictable books for preschoolers and kindergartners. 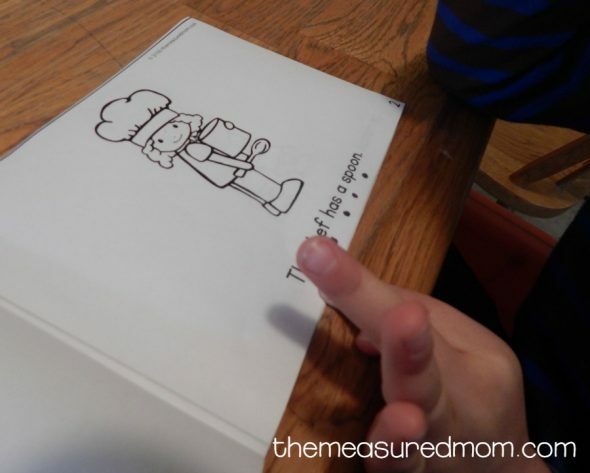 These are great for teaching concepts of print and simple sight words. Today I’m sharing three of those books for free! I began by showing my Three the sight word that would reappear in each of the books. While he still isn’t able to memorize sight words, I wanted to emphasize that the letters t, h, and e make a word. 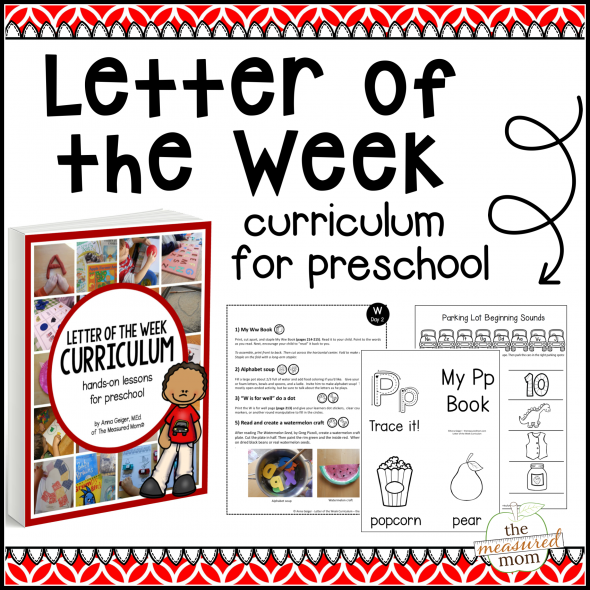 We are still working on the concept of letter, word, and sentence. I asked him to find the word the in the first book. This was easy, since it was the first word in the sentence. 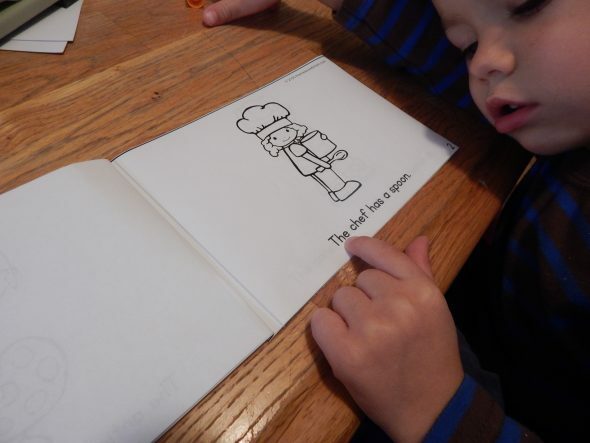 After I modeled the pattern of the book, he was able to read it himself. We moved on to the second book, which was much harder for him. Tracking print of more than a couple of words throws him for a loop, even if he has the pattern memorized. To help him out, I added a dot below each word. 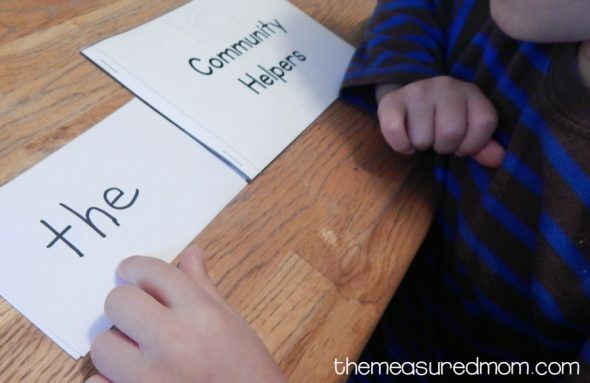 While this doesn’t help him learn sight words, that’s not the goal yet. It does help him separate the sentence into individual words. And that’s our focus right now. The third book was too hard for him, so I read it to him instead. You’ll find it in the download at the end of this post. After all the hard work was done, he was happy to start coloring! 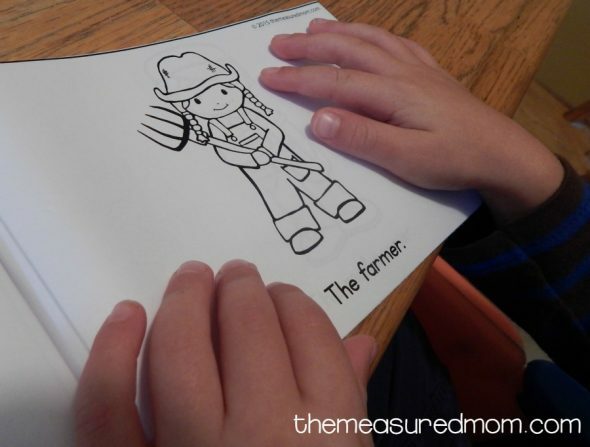 Get the complete set of community helper activities! thank you for all your wonderful little readers! I teach special education and these are perfect! You’re very welcome, Kim! I’m so glad you can use them! Like all of your amazing early readers, my kids loved these! Thank you so much! If you don’t mind me asking, what program did you make the books in? Or more specifically, the character images? 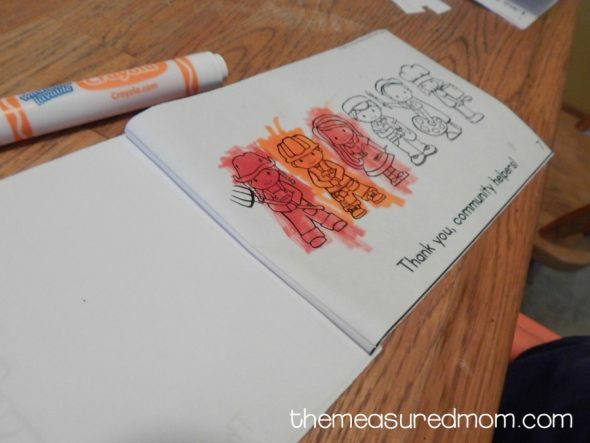 Would you be willing to share the powerpoint template used to make half sheet books? 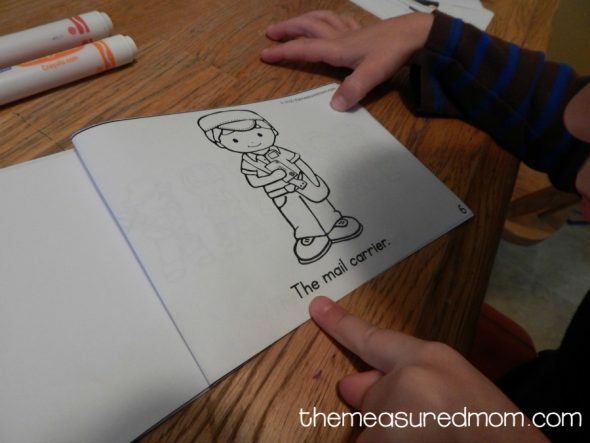 I am hoping to make with my son’s name in them to help him recognize his written name in a sentence. Hi Stephanie! For copyright reasons, I don’t share my templates. It’s really easy though – just make two big text boxes and add images and text. Thank you for the little readers. My students will love them. You’re very welcome, Ruth! I hope this helps you!